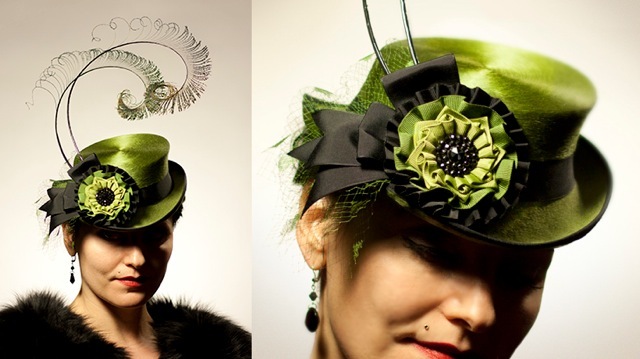 I've just entered a hat making competition organized by leading milliner Stephen Jones. Here's the link to my entry. The winner will be chosen by Stephen Jones and Dolly Jones, editor of Britain's Vogue.com. People can vote online for their favorite hat until August 18th, and special consideration will be given to top voted entries. If you like my work, please vote for me! To do so, just follow the link above and click 'Vote' to vote by Facebook or Twitter. Or, you can send a vote by text message by texting "TH YGW8DF" to 75572. It's easy and free. The winning hat will be shown along with the museum exhibition 'Hats, an Anthology' at Bard Graduate Center in New York City, from September 15, 2011 to April 15, 2012. The winner will get to go to the opening night of the exhibit, and also be offered a 2-week internship at Stephen Jones Millinery in London. As you can imagine, I'm excited beyond words with this amazing opportunity. Here are photos of my entry, titled 'Yvette, en vert'. This top hat was created specially for the contest with custom-made, one-of-a-kind blocks from Guy Morse Brown Hat Blocks in the UK, and inspired by the little ‘doll’ hats popular in the late 1930s through WWII, especially the work of Parisian milliner Yvette Delort. It’s asymmetrical, a complex shape that looks different from every angle. It's modeled here by lovely Autumn Adamme of Dark Garden Corsetry.